If you have not completed your Arizona monsoon roof maintenance, you need to get busy, since July and August are the height of the Arizona monsoon season. Every spring you should have your roof inspected by a roofing contractor in Phoenix and perform any necessary roof repair in preparation for the monsoon season. Gutters and downspouts should also be checked. They must be in good condition, properly fastened down and free of debris so they can effectively channel the heavy rainfall off your roof and away from your foundation. If they have any sags or uneven areas they can collect water and channel it back into your roof. For anyone unfamiliar with the Arizona monsoon season, it runs from June 15th through September 30th. The word monsoon comes from the Arabic word mausim, which means season. The monsoon season is a change in the weather pattern. Arizona’s general weather pattern consists of dry, west to southwest winds. During monsoon season Arizona’s winds come from the south to south east direction, which brings moisture from the Gulf of Mexico and California. That moisture, along with Arizona’s high summer temperatures, fuels the storms. During Arizona’s monsoon season, it’s normally dry air can suddenly see dewpoints as high as 80°. This combination of heat and moisture can bring severe thunderstorms with winds as high as 70 mph, along with hail and torrential downpours, which often result in flash floods. Although it’s unlikely, hurricanes and tornadoes have also been known to occur in Arizona. The storms can blow in quickly and cause a lot of damage, giving us little time to prepare, so it’s important to be as prepared as possible for these damaging storms. One minute everything is calm and the next, your roofing shingles are being blown across your yard. Monsoon storms often produce hail, lightening, and hurricane force winds, which can easily chip, crack, and rip off roofing shingles in Glendale. It may be impossible to find enough storm free days to perform monsoon roof repair once the season is upon us. Having your roof in tip top condition before the monsoon season gives you the best chance of weathering it with the least damage. As if that isn’t enough, monsoon season also brings severe dust storms known as haboobs. These dust storms are formed by strong wind gusts from thunderstorms. As a thunderstorm weakens, it generates strong gusts of wind across the open desert, picking up dust as it goes. What differentiates a haboob from a normal dust storm is the size, which can be up to 60 miles wide, and the fierce winds, which can be up to 60 miles an hour and last for hours. These haboobs are a major hazard. They are the third deadliest weather phenomenon in Arizona, just behind heat and flooding. As you can imagine, the strong winds and thick dust of haboobs are also major causes of monsoon roof repair. Additionally, many people don’t realize that one of the major sources of dusty air leaking into a house comes from the attic and walls, not just from poorly sealed windows and doors. While trees can be a thing of beauty, giving us shade from the scorching sun, fierce winds from haboobs and monsoon storms can turn them into weapons, launching them into vehicles and through roofs. If you are lucky, and only small branches make their way to your roof, they will still interfere with drainage, making your roof more likely to leak during torrential downpours, so be certain your trees are trimmed before the season begins. If you spot any weak or dying trees, they should come down before a storm brings them down on your roof. Not all mold is harmless, like the little green spot on your stale bread. Without a roof inspection, you may be unaware of a small leak that is allowing mold to grow unseen. People often ignore small amounts of mold, even when they can see it. However small amounts of mold mean there is enough moisture for mold to grow, and it can mean there is more mold in the home. Leaks in the attic can go undetected for a long time. Mold hidden behind the ceiling eventually grows through. This leads to small visible spots of mold on the inside. We hear a lot about the dangers of black mold these days. Certainly, all mold is not black mold, but if you have mold present your home it should be inspected. The mycotoxins of black toxic mold can suppress the immune system and cause a range of serious symptoms including mental impairment, respiratory problems, and organ damage. If you need minor Phoenix roof repair, you should get it done before major issues happen. This will save your roof, and possibly even save your ceiling, belongings or your home when the torrential rains and harsh winds come. 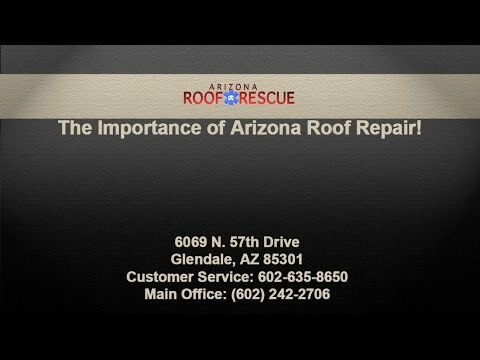 The Importance of Arizona Roof Repair! If you have any small cracks, missing shingles, or areas prone to leaking, such as those around vents and chimneys, a Phoenix roofing contractor can patch those up to prevent more damage. After a storm, you should visually check for damage. Again, look for branches or debris on your roof that need to be removed. Inside of your home keep an eye out for water stains or black, moldy spots on your ceiling or walls. These indicate the beginning of a roof leak which must be repaired quickly in order to avoid major damage. If you are looking for an Phoenix, Arizona roofing contractor for monsoon roof repair or monsoon roof maintenance you need look no further than Arizona Roof Rescue. We are a full service roofing company with decades of experience and NATE certified technicians to serve all of your roofing needs.